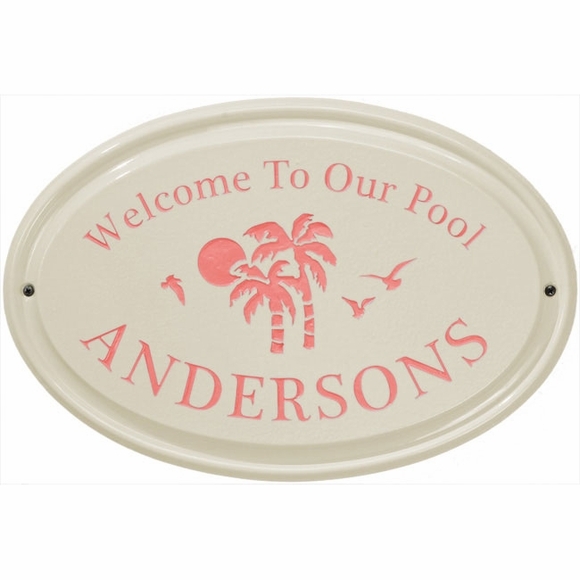 Personalized Welcome To Our Pool Ceramic Plaque - - oval ceramic plaque. USA made high-fired vitrified ceramic withstands outdoor elements. Personalized with one line of text that holds up to twelve (12) 1" characters. All plaques contain the message "Welcome To Our Pool" on a bristol cream background. Image and personalized text can be dark blue, green, sea blue, or coral. Choice of four beach-theme images: sign with palm tree, sign with turtle, sign with star fish, and sign with sand dollar. Total of 16 mix and match color/theme combinations. Small images show palm tree with coral text; turtle with sea blue text; sand dollar with green text; star fish with dark blue text. Welcome guests to your pool with this personalized ceramic plaque.